top speed and 0-60 times maybe even the 50-70 and 50-100 times? Thanks OddJob-that’s good-back on “proper old Aero form then-with the sporty 6.9 times (My old 2002 Aero is the same) A really exilherating drive-I can’t wait to see them in the UK. 210HP 9-3 convertible makes 0-100kmh in 8.0 sec , 80-120kmh in 11.9 sec (official data). This one is only a bit stronger + depends also on manual/automatic transmission. Great looking car, but I fear 366 are too many….should have been 99 made only…. Does anyone knows what the button should do next to the cupholder? On the Griffin version it is not visible, only on the Convertible. Anyone? Is it the onstar system you are talking about? That’s the OnStar button set. I’d imagine the Griffin editions pictured are Euro-spec. Those are definitely NOT 5 spoke wheels…lol. I definitely want a set, though! I’ve been bugging our rep to let me order one since I saw the first photos, he finally admitted we’ll be able to order one next month. With so few being made for the world market, I’m just hoping we can get one! Wow, sharp looking car and even available with a diesel (in Europe only I assume). The dash looks a bit un-Saaby crowded, though. Too many buttons. Un-Saaby? Since when was it un-Saaby to have too many buttons? Personally, it looks just like the current 9-3 dash, same layout and everything. The only difference is the carbon fiber leather dash and slightly different leather stitching and of course the orange paint above the glove box..
Un-Saaby because you won’t be able to hit the right button with mittens on. 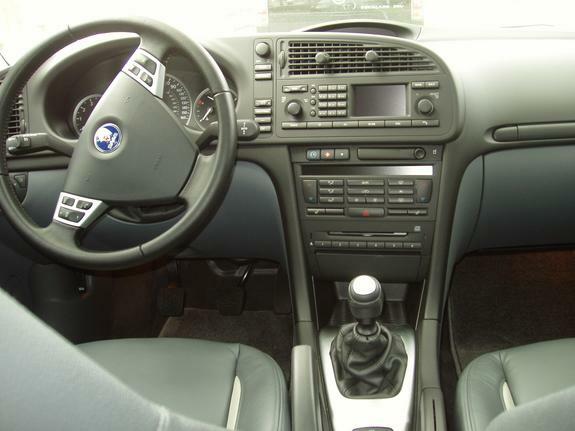 Ergonomics is one of the corner stones of Saab design. Too many small buttons are simply not ergonomic, it’s actually dangerous if you have to start hunting for the right button while driving. I think GM is fully to blame for this. Sorry, let’s not have this discussion because it’s pointless. The new 9-3 will show how the new Saab dash is going to look like. No point in criticizing the old GM dash. GerritN I for one know exaclty what you mean. I would have thought “900” might have deferred there since 900’s right up to og (2002) 9-3 had simple giant buttons you could hit with a reindeer fur mitten!! I remeber when my father got his 2005 9-3 and the panel on that looked like a mini computer keyboard, there must have been 50 buttons on the mid console alone=ergo “unsaabyness” they’ll get back I’m sure…slowly but surely. did anyone see the colour of the soft-top roof ? That dash is AMAZING! Carbon Fibre Leather??? very innovative however they do that! In fact these carbon leather parts are sourced here. I have them in my 9-3x, too. But I am wondering about the soft top colour…? I hope its beige.. I for one love that color and love those wheels! I can see one of those parked in my garage!